Now and then, everybody has to look out for folders on the hard drive which do consume unusual amount of space for a variety of reasons. A very handy tool I am using on GNU/Linux since many years is xdu. The tool is using the visualization technique called layered space-filling tree browser to quickly give you an overview of what (sub-) directories occupy what amount of disk space. The interface looks pretty simple and it is actually simple. It gets the job done. You can navigate through sub-trees by using your mouse and clicking on any directory. 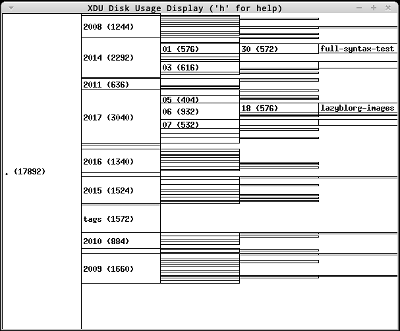 By the way, on OS X I am using Disk Inventory X for the same reason. It's not that fast but more fancy than xdu. However, I seldom use any of those additional features.